Due to my partial European heritage I celebrate "Old Christmas"
the Epiphany on Jan 6th; as well as the traditional American holiday. Part of my personal "celebrations" includes something vintage. 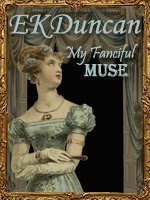 a sneak peek of what new treasures I'll be posting about in 2013. There were lots of great vintage finds available for sale this Holiday season. Some I was lucky enough to purchase including one win on eBay today! Other treasures will continue to remain on my wish list for later down the line. You win some - You loose some but that's just the way of it. So here were my Christmas purchases for this past year - 2012.
can have nice working copies of them for your collection. 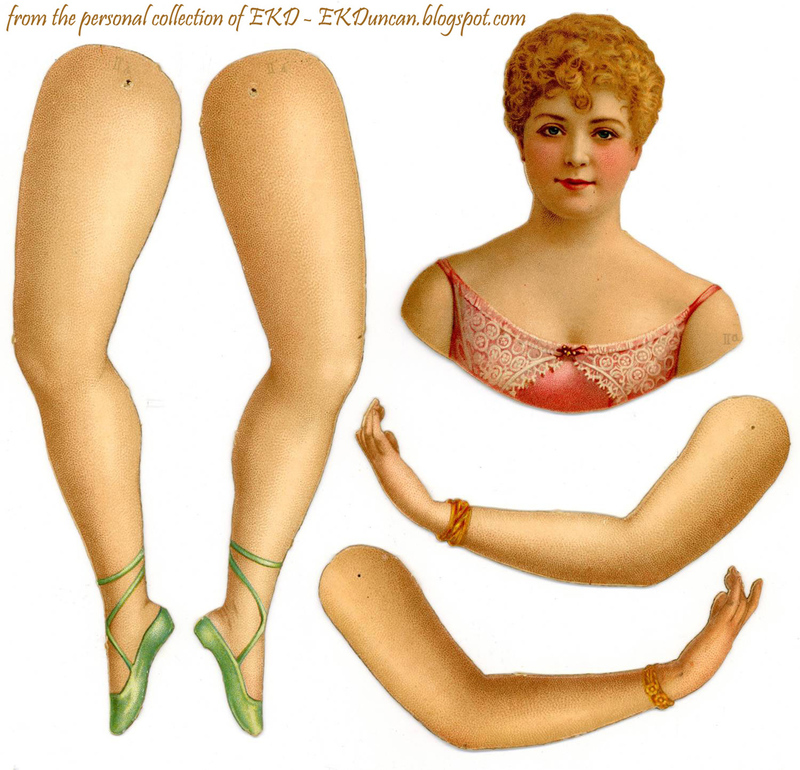 I've added another vintage Dennison to my paper doll collection. 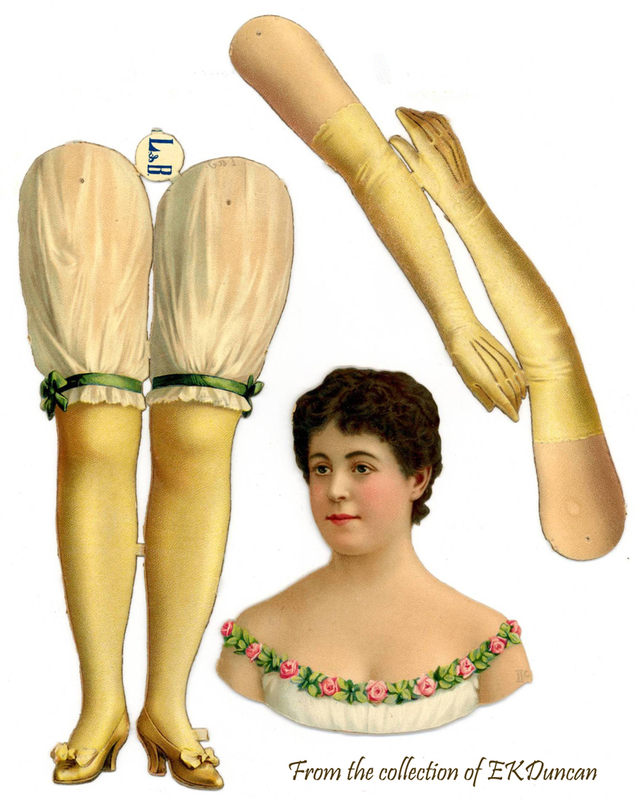 on how to "dress" the articulated ballerina and prima donna dolls they use to sell. 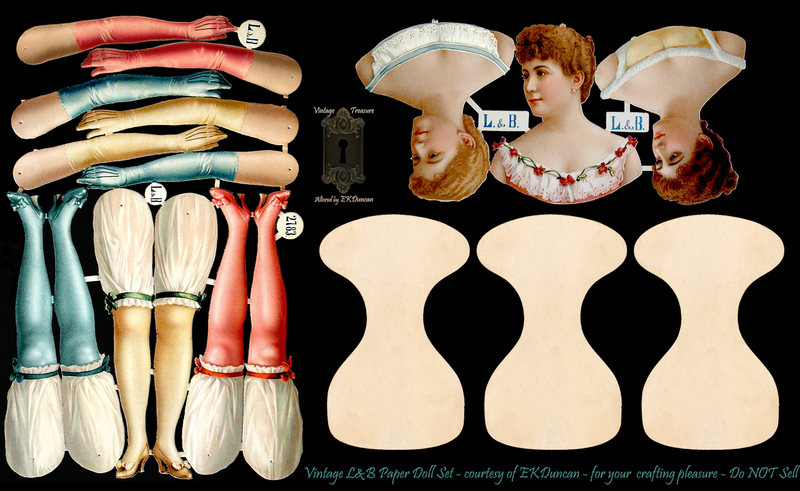 There are 12 posts in all with lots of Vintage L&B paper dolls for you. 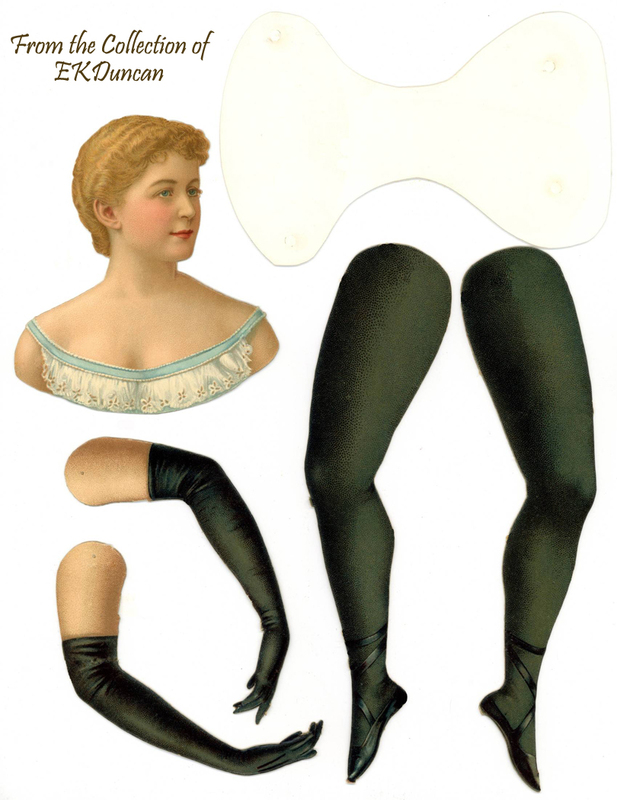 I'll be scanning an posting the doll pages from the 1899 catalog later on in 2012, so you can enjoy new ways on how to decorate the dolls as they were intended back c1900. I also found many of the other c1900 projects most interesting, so I'll have to post those as well. 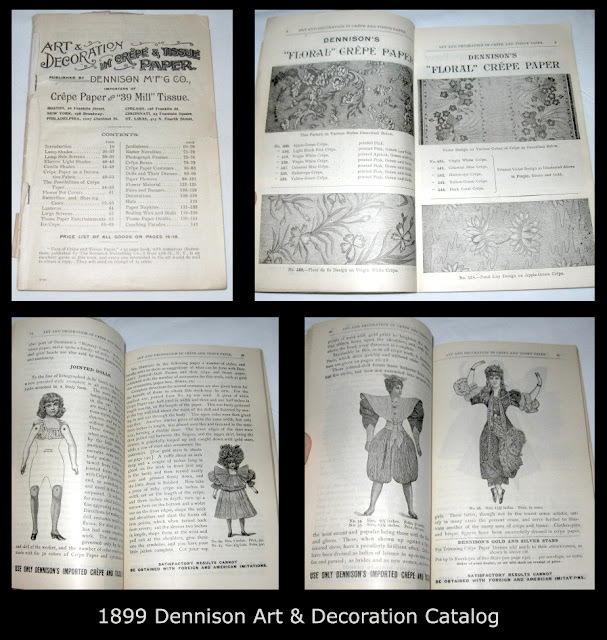 I also hope to explore more of my other 1905 Dennison catalog with you too. 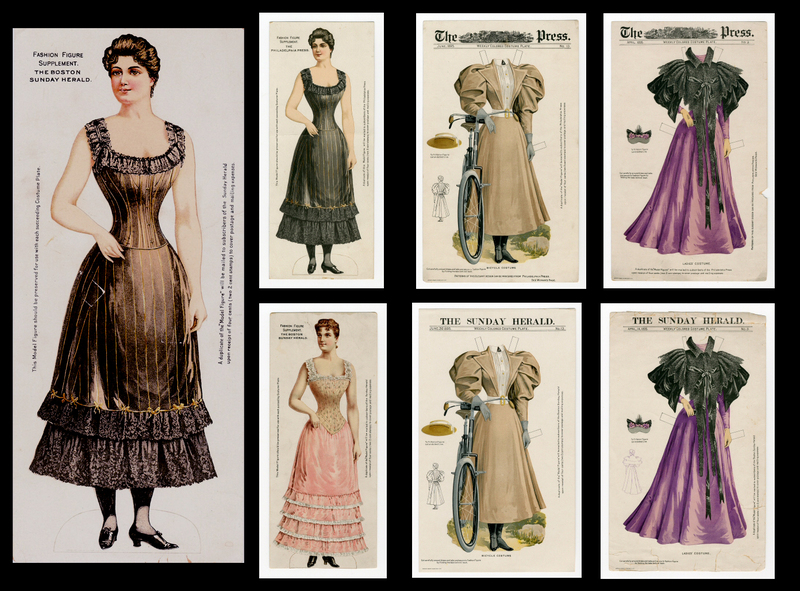 Of the two catalogs I have to say that the 1899 is the best regarding the vintage L&B paper dolls. It just has so much more information about them; which leads me to believe that while they were still selling the dolls in 1905 they may not have been as popular as they were in the late 1880's & the 1890's and the gentleman I purchased the 1899 catalog from informed me that an earlier 1898 catalog contained the same doll pages as this one but an earlier 1894 catalog was different in content, so it looks as I need to continue trying to find the older 1890 and possibly 1880 catalogs. The rest of my purchases were vintage images and Victorian Scraps I could not resist. 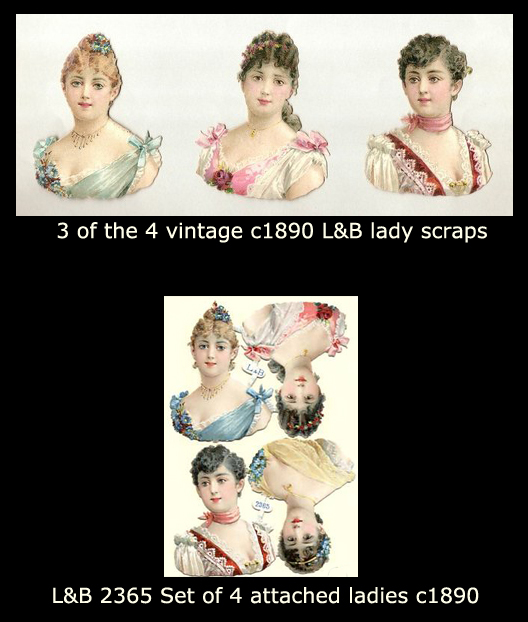 I've been hunting the 4 L&B lady heads as seen in the lower portion of the photo for some time and happened upon an eBay auction for 3 of them and lucky me I got them and they came all the way from France to boot Oh-la-la! As you can see from the three ladies on top they are not as vibrant in color as those still attached and I'm not sure if this is due to "fading" from age or if the three I purchased were printed at a later time than the sheet of 4. It was not uncommon for L&B to produce dies in different sizes and I have found the print quality of others to change depending on if they were printed prior to or after 1900.
doing some digital magic to get them looking similar to their vibrant cousins below. Eventually I hope to add a crisp and vibrant attached set of 4 similar to this reference photo. the same seller in France as the above 3 ladies. them since a similar auction by the same seller went for over $50 in November. This shows that eventually luck has to swing your way if you keep at it. for them along with the three L&B beauties and shipping from France. The detail on these are wonderful and I had never seen any as fancy as these in the past. I know L&B made a variety of watch face scraps and I have my suspicions that they may have made these as well but I'm not 100% sure. 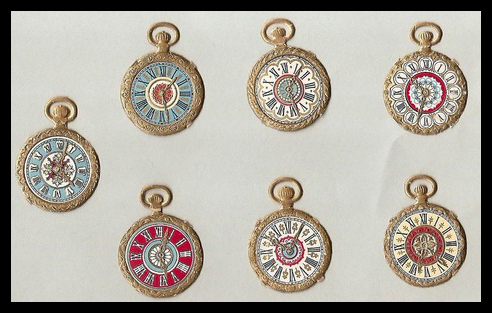 I hope to one day see an entire attached sheet with makers mark so I'll know for sure but if any of you out there know who made these - please clue me in, would ya? to see even though I did not win either of these two auctions. when I found it; then I lucked up and won my auction in Dec for just under $5.00. 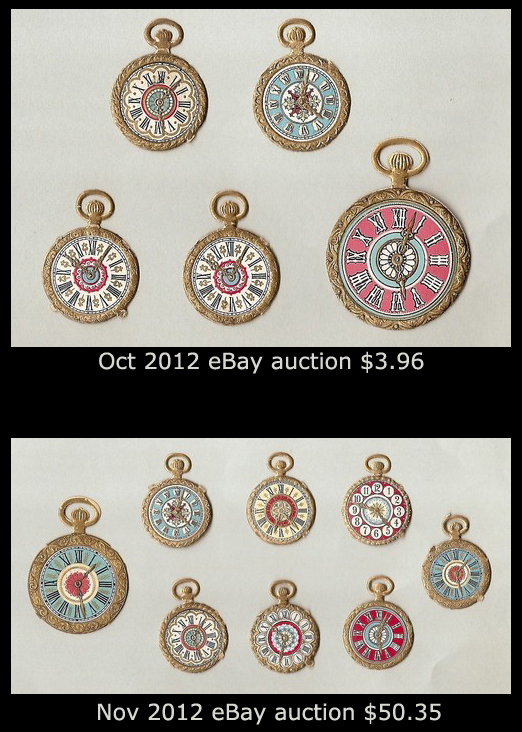 I missed out on was getting the larger images along with my mini watches. New Year and get some more to add to the collection. They are just that cool! - regarding the variety of "Santa" images that were made c1900. and I finally worked a deal with the German seller to get my "Mystic" Santa heads. I'm still waiting on their arrival from overseas and hope to see them soon. I'm not sure if these were intended to be Santa heads or not but I like the idea of using them in that way. 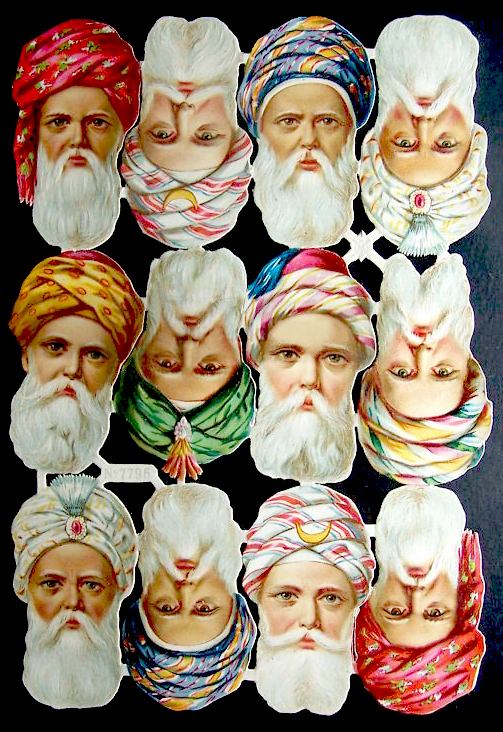 These images could also be used with: mystic, sawammie, fortune teller, pasha or wise men themes. Any way you look at it they just look like a bunch or fun. about seeing how it is compared to L&B and some other vintage scraps I have in my collection. Seeing as they were German made, I'm sure they will measure up just fine. 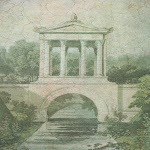 preserving a paper treasure from the past - final negotiated price $90.00. OK - another of my favorite paper collectables are toy theaters or anything to do with a toy theater and I stumbled upon this fun find a few weeks back that now has me searching for more of it's kind. 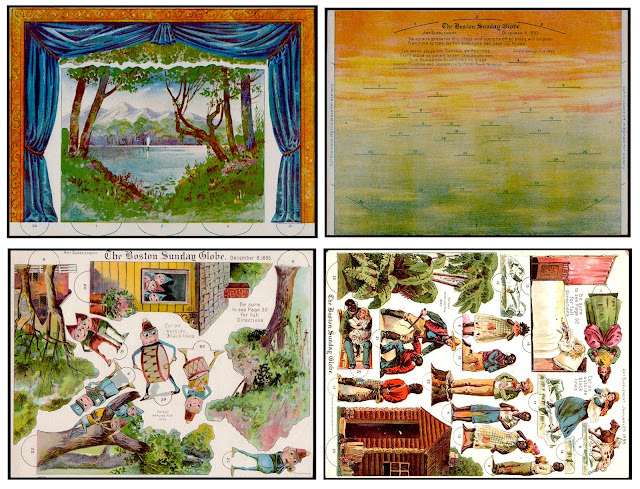 According to the seller other issues of the Philadelphia Press had scenery and plays that could be used with the theater you see below - so it looks like I need to hunt a bit to find the "extras" but at least I have the staging ground. I was so pleasantly surprised by the quality of this vintage newspaper insert but then again the quality of paper items made in the late 1800's seems to be much nicer than what you find today. I thought it was a fair purchase at $40.00 including shipping charges. I'm sure it was bonuses such as these that inspired several to purchase this paper over another paper. For instance this theater was created to have 3 plays to go with it. One that came out in the same issue as the theater and then one each on the next two Sundays. This tri-fold "theater" is made of a light weight cardboard or heavy duty cardstock. It's about the thickness of what cereal boxes are made of . and each of the "wing" sides are 6 wide x 7 1/2"tall. and can be placed easily into a standard sheet protector pocket for safe storage. consideration for me when I purchase vintage images like this one. My thought is to present it in July since it has such a patriotic theme. a growing 1890's newspaper supplement collection going - grins. till I get to see this gem up close and personal. 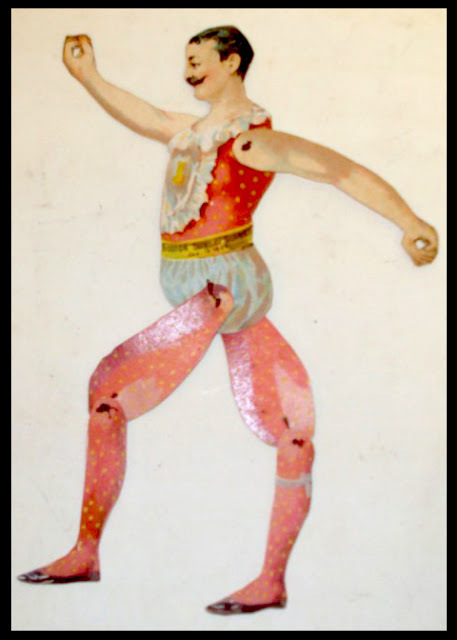 presented as it's Scientific Art Supplement a set of 3 Acrobats. This red one below is the assembled "American" acrobat from that set. When I get him in I'll probably disassemble him, scan his parts and then re-assemble him correctly. I'll probably wait a little while before posting him since I hope to add the other two acrobats so I can post them all together. We'll see how it plays out over the next month or so. what the other two acrobats look like assembled. and then use toothpicks through the hands to get them to work. L&B ladies and passed the acrobats over thinking they were just printed on newspaper. I did not realizing they were a newspaper supplement printed on a much heavier stock. Oh well - live and learn... and I'm always learning! a few Sundays later in Boston, New York, Chicago or some other major paper. you strictly want your collection to be from a specific publication. I'm sure you'll recognize them too. showing up weeks apart in different papers. two weeks ahead of them appearing in the Sunday Herold in Boston. printed these as well just for the grins and giggles of it. with plays published late in Dec 1895 and continued into early 1896. This theater was issued just prior to the Patriotic one I purchased from March 1896. I don't own this one yet but luckily I had reference images of it to share with you. From what I've seen so far on the 1890's Sunday paper theaters; when they published one of these then they would follow up for the next few Sundays with additional sets to add to the theater stage. In this instance The Boston Sunday Globe issued the Theater and the first play with the Brownies on Dec 8, 1895 then on January 26, 1896 they came out with the Uncle Tom's Cabin play. There are probably several more "plays" in between. states - "other plays will be given from time to time". 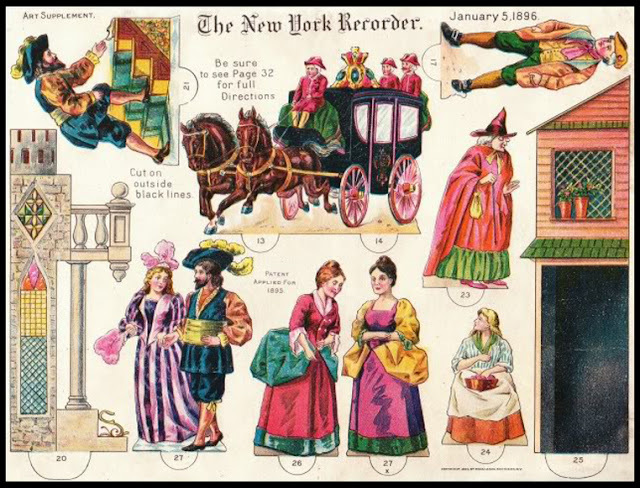 Ironically I've run across this "play" set from the New York Recorder in Jan 1896 .
the New York Recorder also printed that theater and the plays that went with it. I'm not sure how many other Sunday papers around the nation printed these theaters but it gives me hope that I stand a chance at one day getting some of them. and I hope you join me from time to time as I play. I just found your blog and gosh I'm so glad I did!! 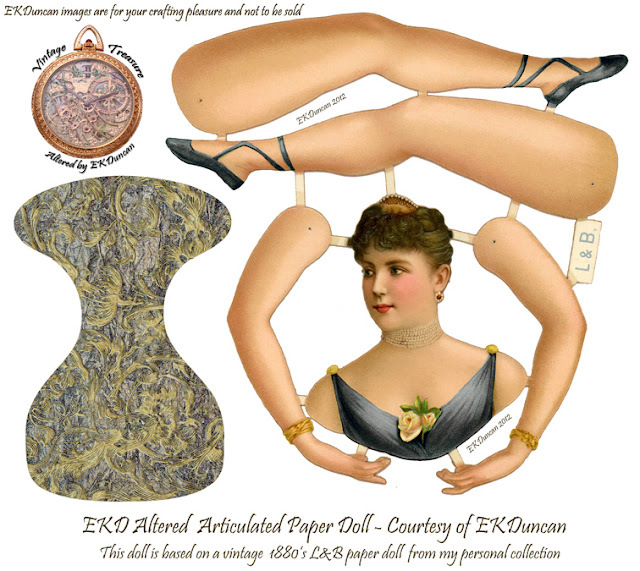 I was searching for victorian ballerina paper dolls on google and found your site. I've just read an article in the January issue of Jeanne D'Arc Living magazine which featured 'Jumping Ballerinas' and I was intrigued. They used the same articulated L&B paper dolls that you feature here. (It is a magazine made in Denmark - see www.JeanneDarcLiving.com). I'm hoping you don't mind if I make some of these dolls based on the images you share here. I'd like them to decorate my daughter's room. Once I do, I would post about it over at my blog with a link back to your website here. And guess what? 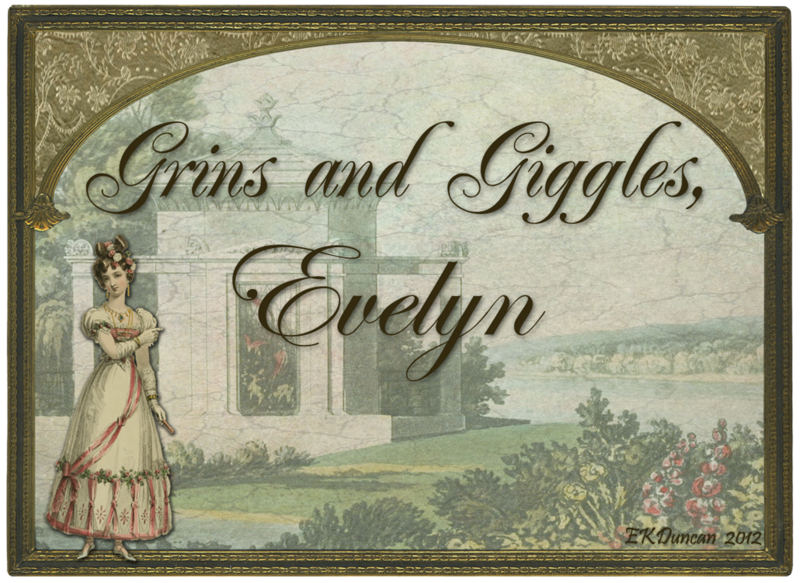 My blog is called 'Evelyn and Rose' - my grandmother's name was Evelyn as is my middle name. What a small world! I just love your site and will plan to follow along your adventures. Welcome to my bog, Susan! Thanks for all the kind words and I'm so glad you found my vintage L&B Ballerina and Prima Donna dolls. I started posting about them back in 2010 and try to post updates or new ones as I get them. In Oct 2012 I did 12 posts of these dolls so there are several to choose from. Your upcoming decorating project for your daughter sound grand and I hope you have lots of fun with the dolls. I look forward to reading your post about it, so please drop me a line with a link once you finish. Yes, small world - I only run into the occasional Evelyn every once and again, so I always enjoy hearing or meeting another. 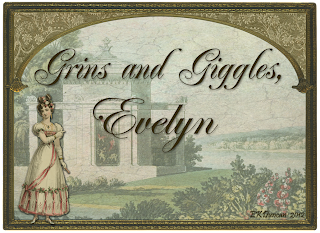 I think we are few and far between because Evelyn use to be a man's name believe it or not - giggles. I look forward to checking out D'Arc so thanks for the link. I hope you enjoy browsing my posts and feel free to leave comments on posts you like or on ones you would like to see more of. You have a very beautiful collection! I didn't know www.thestrong.org website, thank you!!! So I understand you when you say that you can not resist when you find such beautiful things to buy on EBay. I collect fashion newspapers and plates for a few years and I am always moved when I win on EBay, but especially when I get them at home!One day, I would like to possibly share these things on a website, but first I have to make classification and do some research. Thank you so much for this Sneak Peek, it's very very interesting! Hello Sylvie - Thanks for the kind words on my "treasures". We all have some interest and it's fun to blog about it even if you don't yet know a lot about an item. That's how I started my blog. I really enjoy looking at some of my older posts and realizing how much I've learned since I first began. 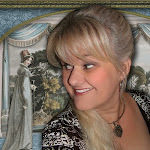 I've also met some wonderful people, like yourself that give me encouragement and let me know someone enjoys the posts. 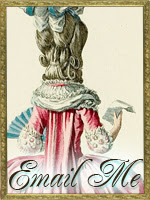 I think you would find posting vintage images on a blog fun. Even if you only post one image a month and give what information you do have on it. Try it you might like it.